Olga's has 9 spacious rooms that combine African traditional architecture and materials with the simple elegance of Italian design. Our guests will therefore be able to enjoy Italian comfort while immersing themselves completely in an African environment. All rooms are equipped with a spacious and well-equipped bathroom. 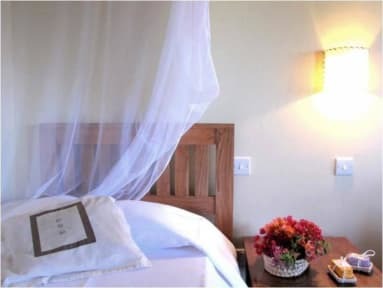 Each room is equipped with mosquito nets and a fan. In our lounge, located in the showroom, you can browse newspapers and surf the Internet with free WiFi access. 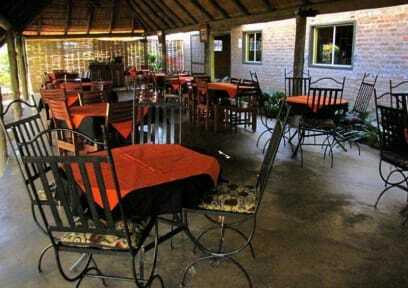 We are the only Italian Restaurant in Livingstone! We offer a wide range of homemade Italian dishes and a delicious Pizza cooked in the traditional Italian way with a wood fired oven. All Olga's profits go to the Youth Community Training Centre (YCTC), a vocational training school for orphans and vulnerable youth based in Livingston built by the Livingstone Diocese in partnership with CeLIM (an Italian NGO running development projects in Zambia since the '80s).